Look at all our Baby Bunches! Bouquets full of cute clothing and necessities! Creative, Beautiful, and Unique Gift! Oh Wow! 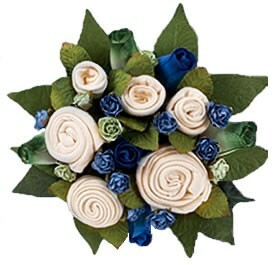 What a joy to give and receive these beautiful organic baby bunch bouquets! This is so pretty you will not want to take it apart but instead get 2 so you can display one for years to come! Each bunch contains a full set of 100% pure organic clothing (0-6mo) designed to give a baby the best possible start in life. Each Organic Baby Bunch includes: one bib, one t-shirt, one hat, one pair of socks and a onesie, gathered into a organically sensitive bouquet of baby clothes perfect for a baby. 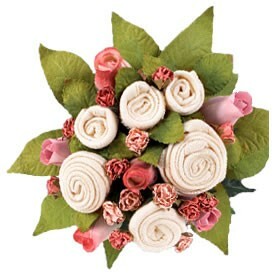 Shipping and handling will be $16.00 per Organic Baby Bunch, email us if ordering multiple for a Discount on Shipping! 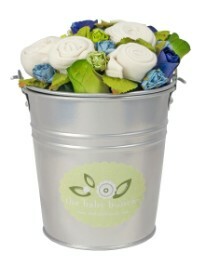 Your generosity will be rewarded - guests, grandparents, godparents and great relations go green with envy over the Bucket Bunches! 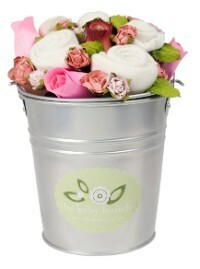 It's simply the best baby gift ever and a unique, yet practical alternative to flowers as a present for a new mom. The Bucket Bunch arrives in a sturdy metal pail and includes: one white bib, one hat, two pairs of socks, and one blue onesie. The baby clothes are made of super-soft 100% cotton and generously sized for infants 0-6 months, or up to 16 lbs. 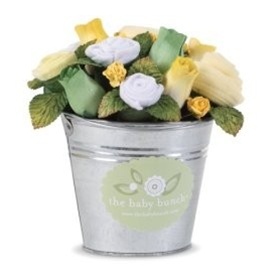 Shipping and handling will be $18.00 per Baby Bunch Pail, email us if ordering multiple for a Discount on Shipping! Patty cake patty cake, baker's man, bake me a cake as fast as you can! Roll the dough, mark it with a B and put it in the oven for baby and me! Need a recipe for a cute baby gift? Give cupcake onesies - no baking required! Everyone loves cupcakes and baby will too. 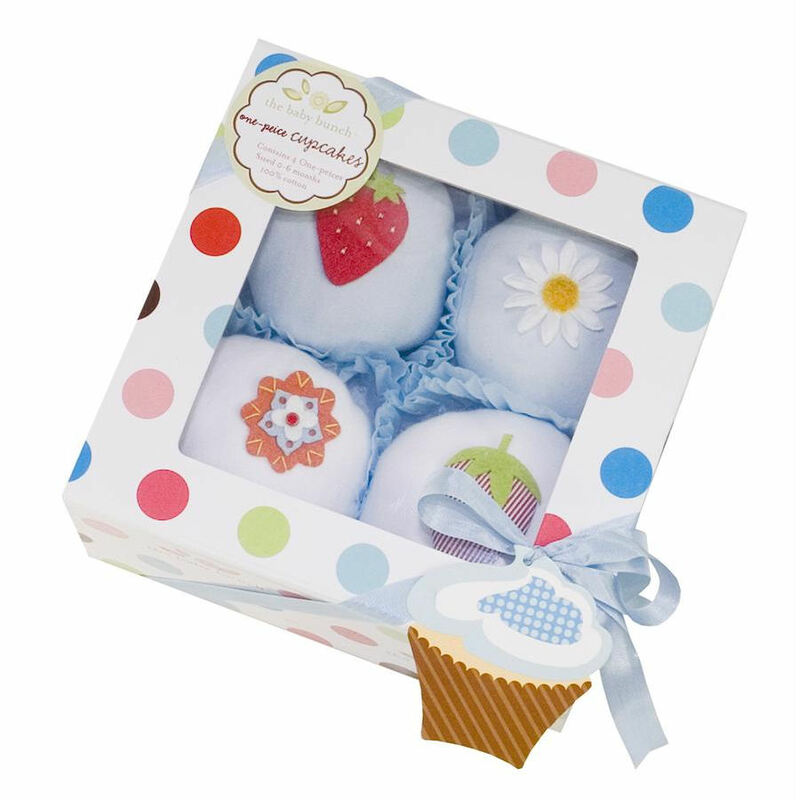 Each 4 Pack dotted bakery box opens to reveal two blue onesies and two white onesies made of super-soft 100% cotton, generously sized for babies 0-6 months or up to 16 lbs. 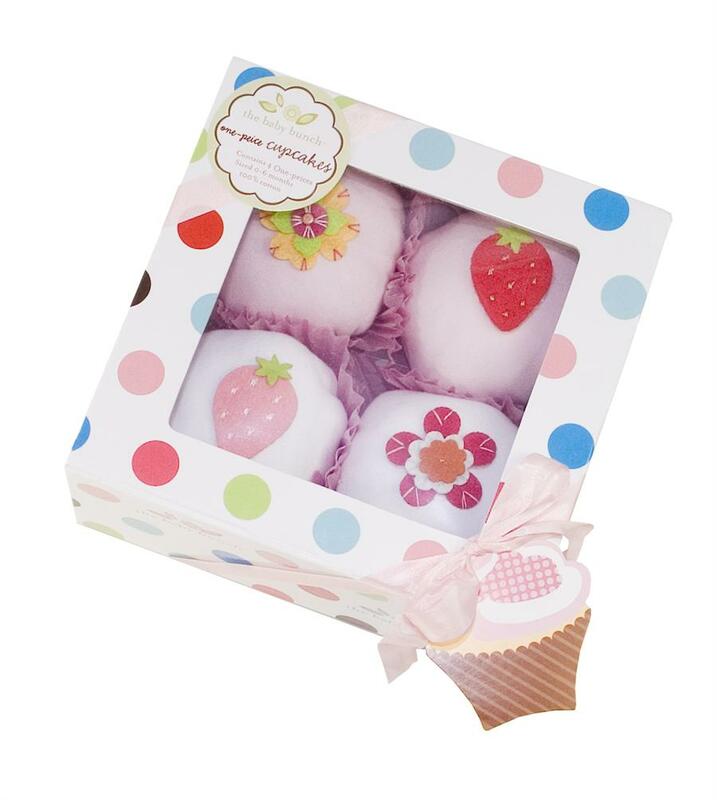 Shipping and handling will be $16.00 per Cupcake/4pk, email us if ordering multiple for a Discount on Shipping!